After touring with the likes of Neil Young and The Killers, Canadian indie-darlings Tegan and Sara will perform songs in support of their upcoming release The Con at St. Matthew’s United Church in Halifax. Due to popular demand, a second show has been added on Wednesday, Oct. 17 at 8 p.m. in addition to the already scheduled performance on Tuesday, Oct. 16 at 8 p.m. Praised for their folk-rock sound, multipart harmonies and charming stage banter, 27-year-old twins from Calgary, Tegan and Sara have spent the last nine years making records and performing for audiences around the globe. 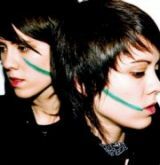 Due to hit stores on Tuesday, July 24, The Con is Tegan and Sara’s fifth studio album. Recorded in early 2007 at The Alberta Court Studio in Portland, OR, The Con was co-produced by the duo and Christopher Walla (Death Cab for Cutie). The album features guest appearances by The Rentals’ Matt Sharp, Death Cab for Cutie’s Jason McGerr, AFI’s Hunter Burgan and Kaki King. Before sitting down to record The Con, Tegan and Sara spent much of their time on the road touring North America, Australia, Europe and Japan. Their song “Walking with a Ghost” was covered by Detroit rockers the White Stripes and they shared the stage with legendary performers Paul McCartney, Hot Hot Heat and the Red Hot Chili Peppers. Tickets for both shows are $25 in advance and $30 day of show (including tax) and are on sale now at all Ticketpro outlets, (United Bookstore, Barrington Street; Greenlyph Computers, Queen Street; Halifax Forum, Windsor St; Alderney Landing, Dartmouth Ferry Terminal; and Newsbreak Cafe and Newsstands at Waverly Road, Isley Avenue, Lady Hammond Road, and Clayton Park) charge by phone 1-888-311-9090, or online at www.ticketpro.ca Major credit cards accepted and service charges apply. Doors open at 7 p.m.